The LDS Church’s most recent General Conference was held April 4-5, 2015. A couple of interesting graphics have been produced as a result. 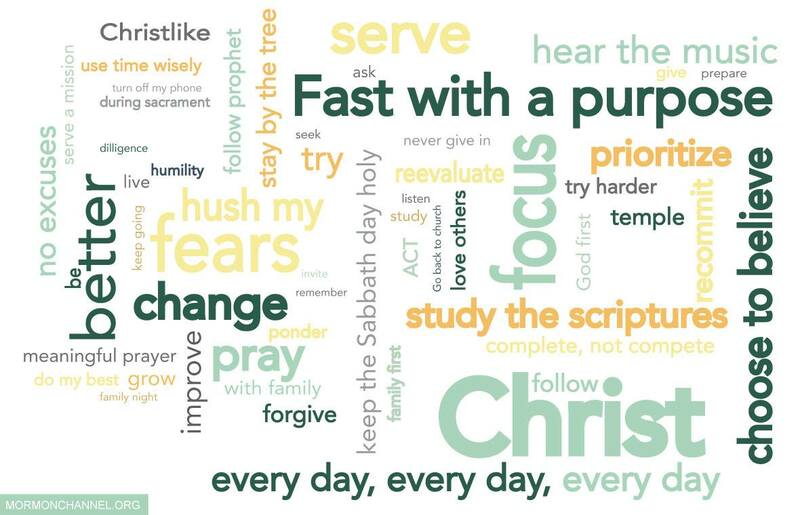 Over at MormonChannel.org’s Facebook page visitors were asked to fill in the blank: “Because of #ldsconf I will __________________.” A few days later Mormon Channel posted this word cloud created with the answers they received. This, then, focuses the Mormon’s take-away from General Conference, anchored with “be better,” “try harder,” and “do my best.” It’s interesting that the essence of President Uchtdorf’s widely acclaimed talk, “The Gift of Grace,” didn’t garner an honorable mention. Another interesting General Conference graphic comes in the form of a chart. This graph displays the number of times the name of Joseph Smith was mentioned in General Conference. It includes data from 10 years: October 2005 – April 2015. The exceptionally high number of references to Joseph Smith in the October 2005 conference was due to that year’s celebration of the 200th anniversary of the Prophet’s birth. 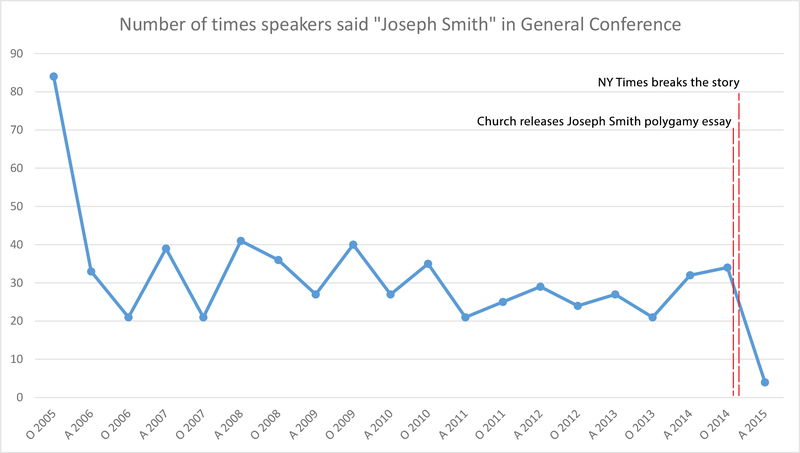 Apart from that, Joseph Smith has been mentioned regularly during general conferences over the past decade at an average frequency of 29.6 times per conference. Until April 2015, that is, when Joseph Smith was mentioned only 4 times. Was Eric’s joke prophetic? Is the LDS Church purposefully beginning to distance itself from Joseph Smith and his controversial history? While nobody seems to know what has caused this startling drop in the use of the Prophet’s name at General Conference, theories abound. What’s your theory? This entry was posted in General Conference, Joseph Smith, LDS Church, Mormon Culture and tagged Church of Jesus Christ of Latter-day Saints, Dieter F. Uchtdorf, General Conference, Joseph Smith, LDS Church, Mormon Church, Mormonism. Bookmark the permalink. That’s really interesting, the number of Mormons who think they need to basically “try harder”. That’s pretty standard stuff for highly controlled, top-down model, legalistic and works oriented religions. How’s that for some word choice? This is, despite the recent presentation on “grace, a performance type religion. I think Christians can be oriented towards self-improvement regarding their walk with the Lord. At some point, hopefully, they get over it. It’s a real trap that eventually leaves people discouraged and defeated. We can never be good enough. I don’t even think about it much any more. Getting saved and understanding that God extends His love and mercy to me regardless of my performance is a very liberating feeling. OK, I can hear you LDS folks shouting at the computer monitor, “SO YOU THINK YOU CAN SIN AS MUCH AS YOU WANT…………….” Listen, sin is no longer an issue with me. I’ve died to sin and am alive in Christ. The life I now lead is in obedience to the Son of God and in gratitude for what He has done for me. Something I couldn’t do for myself. How can I, who have died to sin, continue in it? If I walk in the Spirit as He is in the Spirit the Blood of Jesus cleanses me continually from all of my unrighteousness. I don’t know if a Mormon can really wrap their minds around what I’m saying here. Let me try this. My orientation is towards Jesus not my performance. As a result, my performance aligns with God’s standards. I guarantee you, if you focus on the Lord Jesus Christ and if you are in the Word, your behavior/performance will comport with God’s expectations. It’s an outcome that comes naturally without focusing on performance but on God’s awesome holiness. I wonder if the unusually low rate of references to Joseph Smith is an anomaly similar to the anomalously high rate in October 2005. Maybe speakers avoided Joseph references because it was Easter and they didn’t want to appear too Joseph Smith-centric. We’ll have to see whether or not this is the beginning of a trend. I rather doubt it. I think Tom may be correct . At least everyone listening to Mormon leaders at this last General Conference heard the name Joseph Smith far less , and that’s always a good thing . The Mormon people don’t need Joseph Smith , Brigham Young …. Thomas Monson . A right relationship with God and a complete salvation is available without them . That’s the beautiful news that all Mormons need to hear , and hopefully will cause them to read the New Testament and see what it reveals about this . What’s my theory? I would not be surprised if the LDS church is going to shift gears to using the word ‘grace’ more, even as it continues to speak of all its members can do. Smith may be temporarily set aside, but never abandoned. He may even be rebranded from the naive-farm-boy-turned-lauded-prophet to a flawed man utilized by God for God’s glory. What’s my theory? There is no happenstance with the Mormon hierarchy. Nothing just happens without a primary directive behind it. This reposturing is just as calculated as the essays, both of which are after-effects of the failed plan to lower the missionary age to flood Angloamerica with missionaries to radically increase membership. This failed. Now the plan is to make Utah Mormonism as close to Christianity as possible in hopes that this will increase converts by lessening the divide between the two. Will this fail? Mormon doctrine and history is so cooky that is has been lumped in with Scientology by the masses. That in and of itself is the greatest threat to Mormon evangelism, Mormonism itself. The last chance that Mormonism had to become a dominant force in America was when Joseph Smith was a general and ruled by the barrel of the gun. Religions that rule by force and fear are much harder to confront that those that promote freedom and peace, for the cost of apostasy in these can come with greatest of consequences beyond excommunication. Mormonism is so ridiculous and demonstrably false that it is simply destined to fail in a free and informed populous. It’s not that this strategy will fail, it’s that Mormonism will fail. The LDS church is battling the internet where people have readily available factual information about the sect. They are though, trying to use the internet to win converts. They need to face it. Mormonism is a niche religion. Beyond the Norman Rockwell image is a Stepford Wives type of religion. They are looking at a huge inactive membership. The internet is loaded with testimonials from those who have left the religion. And how many people are going to get into the temple program? So the LDS religion may be getting a new paint job on the old car but what’s under the hood isn’t changing. The drivers of the car aren’t changing. The rules of the LDS road aren’t changing. Mormons need to get real. How many people are going to believe the Joseph Smith fiction and then join a group that demands total loyalty and submission? I wasn’t aware of the results of the lowering of the age to become a missionary. I suppose the powers-that-be did some quick calculation and figured that if they increased the number of missionaries, looking at the per missionary closing rate with prospects, BOOM more members. What they failed to realize is that the pool of potential converts didn’t increase; that is, those who might be interested in becoming a Mormon. I had read that someone suggested that the LDS church would be better off trying to Mormonize those already in the fold, reducing the numbers leaving and going inactive. The task at hand in bringing a prospect into the church and then all the way to active participating in the temple program is long, arduous and has an appeal to a very small number of converts. I liked the Mormon channel graphic. On the surface those are all good qualities. There is nothing wrong with any of them. All are good qualities to have. However, the lists above are simply things all Mormons must do now by assignment or by setting personal, ward and stake goals. Even friendship in the Mormon Church is by assignment. All members are assigned home teachers and in addition all women are assigned visiting teachers. In effect this blunts any spontaneous Christ-like caring because either they are way too busy doing their own friendship and callings by assignment, or else assume someone else is probably doing something for that person in need anyway, likewise by assignment. Many Mormons will admit that doing good works by assignment is not ideal but wrestle with the “after all you can do”, and “enduring to the end”, and “faith without works is dead”, etc. Some feel that as you learn to “do”, grace will come and eventually the good works that should flow from grace and belief in Christ will flow more naturally. Thus obedience to the law being the way to grace. But there is never a time in the life of a Mormon when the training wheels are taken off. Even if you believe this is a way to help you become Christ-like, there is never a release from the commandments to do good works by obedience. 80 year old’s in the mission field still have to report and live mission rules. I know Mormons will point to the fact that they are told to do good works in and of themselves because they follow Christ and not because they are required. But with Sunday meetings lasting between 3-10 hours, Tuesday night leadership meetings, mutual night, missionary activities, ward socials, cleaning the chapels, baptisms, home teaching, visiting teaching, calling preparations (up to 20 hours a week), seminary, boy scouts, cub scouts, activity days, (all youth activities require a heavy adult presence. In many wards outside Utah there are more adults in evolved with youth than there are youth! Add in travel times, as most non-Utah wards have some travel times for every one of these activities ranging from 10 minutes to possibly an hour and typically probably 20-30 minutes. Think of all of those activities and then add 25 minutes each way in travel almost every single day of the week! Who has the energy to even contemplate their relationship with Christ? Add in all of the reporting and discussions and lists of those in physical and spiritual need and special assignments to reactivate and fellowship and then report on such. Church attendance is kept for each an every activity. Wards are doled out money based on Sacrament Meeting attendance. All home visits are reported. Temple attendance is not kept individually but it is kept on the ward and stake level. Reporting is a good way for the church to track progress. But then it’s nothing more than assignment and works. Reporting something makes it man made. I highly doubt at the final day, Jesus is going to meet with Mormons and review their individual home teaching records. In addition, good numbers are required and reported on, which leads to bolstering the numbers and lying about attendance and what you did. tIf numbers slip on any quantifiable, leadership will be corrected from the ward level to the stake level. Then Stake Presidents are monitored with overall stake numbers and they are then corrected and chastised. But like any western business model, if the numbers are good this year, they will need to be even better next year. Goals!! The truth is it’s almost impossible to “do” anything in the Mormon religion and not either know you are being monitored for it or, worse yet, contemplate silently how many blessings in Heaven you just received for doing a good work outside of the box. Either way, it leads to a form of capitalism, tallying up good works for rewards in Heaven. In many ways it’s blatant, in some ways hidden, but it is a corruption of grace and what should be a leaning on Christ and attitudes being changed from within. Mormons feel offended if they are tracked into by a JW or SDA. “How dare they have knocked on my door! The nerve of those deluded people!” Not unlike the irony when they deride the deluded Old Testament Israelites for becoming caught up in the letter of the law. There is something to “accomplishment” because that is the Western ethos. But it is not Christ’s teaching. Mormons are trying to make Christians with cookie cutter molds. And ultimately it’s not Christ like at all. It doesn’t create Christians, it creates capitalists and competition and many times a feeling others are not pulling the same weight as you are, or a shame or guilt that you are not pulling your own weight. Both are really bad. Christ would not have us act out of shame. Good does not evolve from evil. Mormonism is a bastardization of Christianity. I should like to add one thing to the last paragraph, worse than all, is the pride it creates in those in leadership positions who are trying to look good for possible advancement in the church. Don’t think this does not happen. No one should aspire to callings but not all callings are created or thought of equally. Some people like to be in charge over others. Mormonism breeds this in the business model. Look at who are called to be mission presidents, stake presidents and general authorities? Almost without exception you will find highly successful CEO’s, attorneys, surgeons etc. What spiritual qualities do men like theses possess? The ability to get things done. The Mormon Church is literally running a business and the members are the employees. Except these employees all pay for the privilege to “work” for the Church. A couple of thoughts. First of all this is what could be classified as a “cult”. Sorry Mormon lurkers but a spade is a spade. Secondly, how many people are going to get roped into a deal like this? The MM present one picture of the sect but in practice, it’s entirely something different. That’s why retention rates are so low and inactive rates are so high in Mormonism as practiced by the LDS sect. A person would have to grow-up in the LDS sect and be conditioned over time to buy-into it. The average Jane and Joe Doakes, who join because they like the family programs, aren’t going to jump into the rest of it. Andy Watson visited a ward one time because they were advertising all of their programs. The faithful had set-up this big room with all of these display tables promoting the family friendly programs. All went along fine until Andy started asking the ever present MM some pointed questions. It wasn’t long before the bishop showed-up to shut Andy’s interaction down. It’s all blatantly dishonest and very typical of cult recruiting tactics. Once a LDS member loses their fear, the strangle hold just isn’t effective any more. Maybe a good goal for a Mormon would be to get rid of the fear that’s been implanted in their minds by the cult. The LDS church is all about control. Vax has outlined very well what the sect does to keep their members in the group. It’s all classic cult control techniques. They implant fear and keep the folks busy. Good feelings are the Holy Spirit, bad feelings are the devil. I don’t know what impact, if any, I had on those to MM that came walking up my driveway on Friday. I thought it was interesting, BTW, that they parked down on the rural road going passed my farm, and chose to walk up. Perhaps a little surprise attack technique. My two outside dogs, however, are there to alert us, which they did. It is true. We plant seeds. I don’t think that’s a cop-out. My guess is that most LDS folks leave the group after accessing information on their own and coming to some conclusion not favorable to the sect. One interesting thing, the lead MM said that he wanted me to prove from the Bible that Jesus was who I claimed He was and not what the LDS believe. It was getting dark and we were standing outside so I couldn’t jump into it. However I’ve been thinking and I can see where the MM could twist the Bible verses to support the LDS view of Jesus. So I’m going to have to do some prep work to figure out how to head this off. But I remember reading how frustrated the Church Fathers would get with the heretics who claimed “secret knowledge”. I think it is conditioning and fear. I don’t think it’s as simple as education. For example look at the number of people that refuse to look at hard data in regards to climate control or vaccines but still don’t believe in it. In addition there is so much to lose by leaving Mormon culture whch is so tight. It’s tough to leave when almost your entire non-school, non-work life (though in some cases if you go to school in church system school or employed by church it is 100%) and all of you social contacts and friends and all the conditioning and rationalizations… there is literally an answer for everything, and if not you park your concern in the faith faile, or the “milk before meat” file, or the worthiness file. The biggest thing for me was it’s just so tough to pay the social price to leave. And so much invested, time, energy, talent, money!!! It’s tough to stop momentum and the longer you are there the more force and difficulty to break out of it. For me it was the fruits born and a crisis or two which opened my eyes. Once I left I was never once chased or even sought out. It was good riddance. I’m sure there were sadness and regret from certain individual members, not all, but the work goes on and people get over it. They have to. There is too much to be done to go after the one (even though they say that is their mission, again the fruits don’t match the talk). I know many feel they won’t be left alone if or when they leave. I was never contacted once I requested my name removed. Not once. After an entire life in the church! I would like to say I left easily once a “figured it out” but it was very painful for me and there was a bit of kicking and screaming so to speak with my Stake Pres. before I left. It’s HARD!!! Once I did, I almost immediately felt better and though I am still hurting in some ways, really only socially to be honest. I no longer have any splinter of testimony that it is the truth. But it’s not all evil or it would attract or keep no one! Again, that first image in the post shows all good traits in life. Who wouldn’t be proud to have those qualities about applied to them? There is a superfical attractiveness. I sincerely doubt if I hadn’t been born into it I ever could have been converted to it though. I was pretty high up in local leadership. I’ve seen a lot. That’s what also gives me pain. I was right there, part of disseminating talks and testimony and lessons. At least I tried to be authentic and honest and when something didn’t make any sense I would say so. People aren’t perfect and I never thought JS or any man or prophet was perfect. but you can bury and rationalize a lot when you you are motivated to do so and have been conditioned to do so since you can remember. For some reason, I think you might find this interesting. This is a little off topic but I’ll try to connect it. The LDS folks are really into self-improvement as a means to becoming gods. After all, nobody is going to become a god in the LDS system unless they’ve worked pretty tirelessly to improve themselves and serve the LDS machine/corp. So we can be certain that the motive for godly living is motivated by a desire to get to the Celestial Kingdom, be united with their forever family and rule their own planetary system as gods. In my recent encounter with the MM I did get the lead (missionary) to admit he believed he would become a god. It was about at that point that the conversation began to deteriorate along with his challenge for me to prove from the Bible that Jesus is who I claimed Him to be. As I thought about this, I was thinking that before I even entered such a discussion, some ground rules or principles of Biblical interpretation would have to be established. With folks like these LDS sect members who believe they are going to become gods…………….well the spiritual deception is mighty and very deep. Just for fun, I decided to “google”, “prove Jesus is the Son of God from the Bible”. There is a huge amount of material available from reliable sources on this topic. So if LDS folks want to better prepare themselves for GC, why not set a goal of examining who Jesus is and what God’s plan of salvation entails. The problem is, if they did this, they would no longer be members of the LDS sect. It would be a problem because of the spiritual free fall they would find themselves in. The rug would literally pulled out from under them. But the Good News is that Jesus will catch them. Anytime I get discouraged that witnessing to Mormons is like banging my head against a wall, I can turn to various videos of former Mormons. The consistent message that I take away is that our job is planting seeds. God does the watering through His Holy Spirit. There is a harvest. I like the “Adam’s Road” group, their music and testimonies. Here’s a video of a concert they did in Houston this past February. I notice that of the many things that Mormons listening to general Conference took away from it most mentioned ” follow Christ ” . I realize that Mormons really believe that they are following Jesus Christ . But what about Mormon leaders ? I have to concentrate on them in order to evaluate this issue of ” follow Christ ” . Have Mormon leaders somehow detoured rank and file members into accepting a imitation gospel ? Are LDS following Christ or are they following prophets who claim to have been appointed by Christ , but who have not been ? Jn 8: 31 ; 17:17 . Jesus’ apostles preached what they learned from Him , and they took that far and wide , people repented and received the gift of complete salvation — Rom 1:16 ; Heb 7:25 . Did Joseph Smith , Brigham Young , John Taylor , Wilford Woodruff ….. continue , abide , In His word ? If not, are LDS following prophets not appointed by Him ? Can a false prophet look good , dress well , act polite , and talk about Jesus be an individual that was not actually appointed by Him but who ” feels “He has been ? Actually, this newfound/temporary reticence among Mormons to discuss Joseph Smith suggests a very simple way to deal with Mormons. Instead of starting with a discussion of grace (which Mormons already think they understand) and an endless argument, try starting with Joseph Smith. Almost all Mormons will be happy to discuss Joseph Smith if they think you approve of the church he started and its moral compass. — why the Mormon Church would try to conceal all of this for the past 180 years if it was a teaching of God. If you ask sincerely and in a friendly manner, emphasizing that the problem is not with the church, but is instead with your ability to understand the doctrine, without condemning your friend or the LDS Church, your friend will most likely not be offended and may even engage in a heartfelt discussion of his/her concerns about the Mormon Church. Henry David Thoreau said, “The mass of men lead lives of quiet desperation.” This is true of many Mormons, who can’t find the strength to acknowledge their doubts or to walk away from the Mormon Church. Your friend may be one of them, and a friendly word from you could make all the difference.